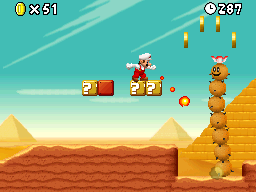 World 2-1 is the first level of World 2 in New Super Mario Bros. It is the first desert level in the game. This level starts out with four ? Blocks, with a power-up in the second. A Pokey appears as the first enemy of the level. Above the Pokey resides four coins. After the Pokey, a Spiny can be found. The player finds three Brick Blocks and a Pokey after the Spiny. The first Star Coin can be found nearby, along with another Pokey. The player then finds three Pokeys and some floating platforms. The second Star Coin can be found by some quicksand and another Pokey. After the player passes the second Star Coin, they encounter a pit, with a Pokey and a few more floating platforms above it. Once the player passes the pit, the Checkpoint Flag is activated. After the checkpoint, the player sees three Brick Blocks and a ? Block. The player then finds four pits, with each containing a Pokey inside of it. The final Star Coin can be found in the fourth pit. At the end of this pit, there is a mini Warp Pipe which can only be accessed via the use of a Mini Mushroom, and it contains a maze and several coins inside of it. After this, the player finds another pit with floating platforms and a Pokey above it. Past the pit, the player must enter a pipe to continue in the level. On the other end of the pipe, there are some blocks, and the middle one contains a P Switch. By activating the P Switch, the small bridge of coins ahead turns into Brick Blocks, which allows the player to reach the Goal Pole. Star Coin 1 - The first Star Coin is located in mid-air. It can easily be obtained, but Mario should take caution of the nearby Pokey. Star Coin 2 - The second Star Coin is above some quicksand in the air. 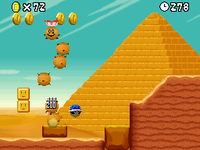 However, a Pokey on a moving platform can cause some difficulties getting the coin. Star Coin 3 - The final Star Coin is located on the bottom of the level, but two Pokeys on moving platforms can be a nuisance. This page was last edited on April 4, 2019, at 21:32.